It’s an ill wind that blows nobody any good, they say, and certainly the chill wind that has been blowing snow and ice across the Wicklow Mountains for almost two months has not been totally unkind. I find it has obliged me to renew acquaintance with humble yet more accessible outliers, and I have been pleasantly surprised. The Little Sugar Loaf is a good example. Barely 342m at its highest point (GPS reading: O 2607 1447 D) and no more that a 20 minute climb from the Bohilla Lane starting-point (O 256 141 E), it will add little glory to your mountaineering CV, but don’t write it off too quickly. The walk along the ridge and around the slopes offers great views on every side. Bring your binoculars and a camera and you have hours of contentment before you. To the W, the Great Sugar Loaf imposes its presence (see photo), but you would be inclined to think it no higher than its little namesake. It’s an optical illusion that conceals a difference of 159m. To the NW, your view plunges into Glencree Valley and only ends abruptly at the twin corries of Lough Bray Upper and Lower, with the mast on Kippure standing guard above. 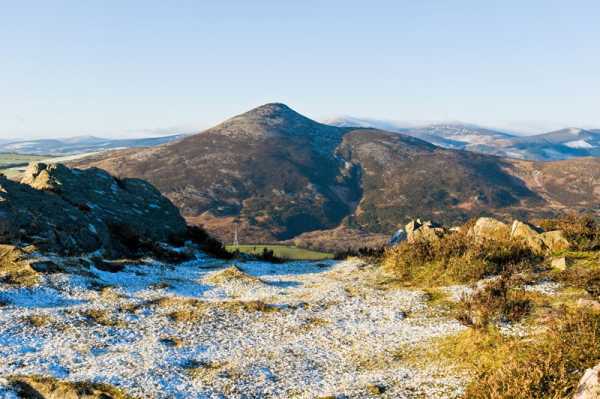 To the N and NE, the view stretches beyond Dublin Port to Howth and back along the Dalkey-Killiney coast to Bray. Directly E, the knobbly hillocks at Bray Head block the view to sea, but it’s again visible at Greystones before disappearing in a haze to the S. My attention was caught, too, by the historical Kilruddery House and Gardens, in the valley to the NE. Scenes from many films or TV series – among them The Tudors – have been shot around this Elizabethan revival house, whose beginnings go back, in fact, to the 17th century. With binoculars, I could even get glimpses of the classical statues in the glass-covered Orangery.